With what seemed like 1.5 million people watching in the stands, Bossa earned her 20th double Q under judge Scott Stock at the Rose City Classic in Portland, Oregon. It took a while, but Bossa earned her MX title under Lavonda Herring at Mission Circuit (LA Fairplex in Pomona, CA). Bossa continues to do well in Jumpers, earning her MXJ title under Bob Jeffers at the Golden Retriever Club of Greater San Diego's trial in Point Loma, CA. We had to re-train Bossa's teeter performance, but she finally earned her third Excellent Standard leg and her AX title. Now she's in the big leagues, hunting for double Qs. In her first outing in Masters JWW Bossa earned her first 13 MACH points! Bossa earned her second Excellent Jumpers leg on December 13, and then qualified for a third time on December 21, earning her Excellent Jumpers (AXJ title). Bossa earned her first leg in Excellent Jumpers with a steady performance in light rain . She would have placed third in Masters! Her Excellent Standard run was a big improvement. She made all of her contacts and the table performance was great. Unfortunately she took a wrong course, and later had a fault at the weaves. Still very promising. We've started a log of all of Bossa's Excellent/Masters runs (starting with today's). That log will eventually track her progress to her MACH title. Bossa ran in both Excellent classes for the first time today, and while she didn't qualify in either run, she definitely caught the eye of a lot of competitors. The biggest change from the earlier part of her career is that now she's running in the busiest part of the day. There are lots of dogs around, lots of people, lots of distractions. I'm confident that she will gain the ring experience needed to perform in this environment. Go Bossa! 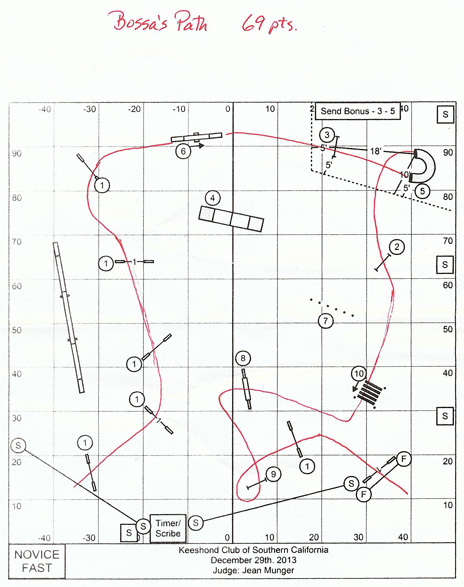 The Open Standard course was really tricky, and the weave entrance was harder than the excellent version. Bossa overshot pole three, but did them right on the second pass. That was good for first place (four qualifiers) and her Open Standard title. She also ran in Excellent Jumpers for the first time, and knocked a bar after some loose footing. Otherwise she looked like she belonged in the class - a very nice performance. Bossa hit the weaves way too fast and face-planted into the second pole. We recovered and took first place with a 95 score for Bossa's second OA leg on a hot day up in Camarillo. For the first time, Bossa turned in a pair of runs with a perfect score of 100. Her first run in Open Standard was a 100 score with a time of 44:17 seconds (SCT 77 sec), the fastest time of all Open dogs, at all heights. On the Open Jumpers course, Bossa again had a clean run with the fastest time of all dogs at all heights (26:29 seconds, SCT 42 sec.) With her third qualifying performance in Jumpers, she earns her OAJ title. 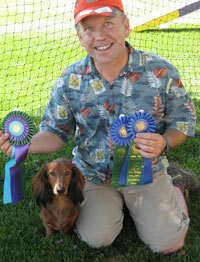 Bossa made up for a few handling errors to qualify in first place at the Kennel Club of Pasadena's agility trial, earning her Novice Standard title. Bossa's second qualifying run in Standard was at Mission Circuit the week before. 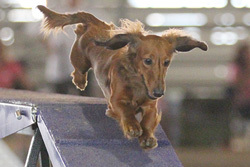 At the 2014 DCA Agility trial, Bossa's 95 points in Open Jumpers was enough to win High in Trial for the Jumpers classes. Unfortunately, a knocked bar on the Standard course kept her from also winning the Standard award. The day before, Bossa earned her first Open Jumpers leg in Palo Alto, CA. Bossa has now qualified twice in Open Jumpers, and once in Novice Standard. Bossa had her first clean run in the novice classes on a 21 second JWW run under judge Lavonda Herring to earn her NAJ title. 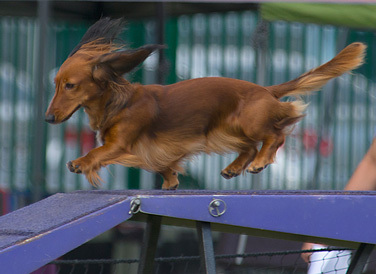 In the novice standard ring, she completed the chute for the first time in competition, but knocked the double (early take-off) and jumped off the top of the dog walk. We entered Bossa in the regular Novice classes for the first time at a trial that was scheduled to be outdoors and minutes from our house. But due to a late winter storm, the trial was moved to a horse barn at the Los Angeles Fairgrounds many miles away in Pomona, California. Bossa and John had not been to class in almost a month but still did great! Bossa was fast and attentive -- never sniffing or distracted. Bossa easily earned two legs in Novice Jumpers with Weaves (she needs 3 for her title), running in about half the allowed course time and earning two first place ribbons. There were only two problems -- they went into the weaves too fast and needed a second attempt each time. And somewhat to our surprise, Bossa didn't go through the chute on either Standard course, so she didn't qualify in Novice Standard. Bossa turned two years old on March 4th, so it's time to get her permanent height card! 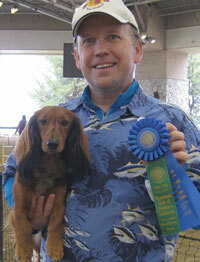 Bossa earned her third Q and her Novice FAST (NF) title at the Mensona Kennel Club in Santa Rosa, California. After a week of hunting events at the Dachshund Club of America's National Field Trial and Earthdog Test, Bossa was pretty excited. She had even more energy and "zoom" than she had in her first two legs. She had no trouble with the send bonus - jump to the seesaw - but it took a few tries to get the weave poles. The time she spent on the weaves cost her first place, but we were happy with a third place ribbon and the new title. We entered Bossa in her first agility trial in early September 2013, in Novice FAST. She missed the Send Bonus and didn't qualify, but we were thrlled with her attitude. Bossa and John ran in Novice FAST again on 29 November 2013. Bossa showed significant improvement following John's handling and easily performed the Send Bonus. She earned 69 out of 80 possible points (with only 50 needed to qualify) and first place in the 8" class. And she was FAST!! Below is the course map, with Bossa's path marked in red. For those who aren't familar with FAST, each obstacle is worth the indicated points and the handler chooses the obstacles and path to run with the dog. The only requirement is that you complete the Send Bonus (in this case jump to near end of the tunnel) with the handler staying outside the marked line, and get a total of 50 points (including the 20 point Send Bonus) within the allowed time.